Class 8 created a 'fruity' scale model of our solar system on the playground last week. We chose fruits that best represented each of the planets and worked together to convert from millions of kilometres to millimetres so it would fit! Afterwards, we enjoyed a fruit tasting session with the (clean) left over fruits. Jupiter (the watermelon) was definitely our favourite and we found the lime very tangy! Lots of us tasted grapefruit for the first time and found we quite liked it. 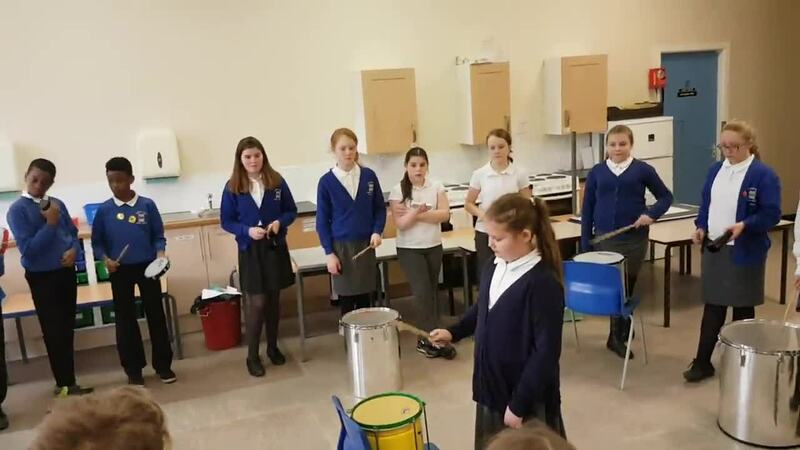 This year the children in Y6 have been learning how to play a variety of percussion instruments and Y5 have been learning how to play the trumpet or cornet. On Wednesday 21st June, seventy two children performed in a music festival at Elsecar Heritage Centre. They thoroughly enjoyed themselves and I'm sure all the spectators did too! Mrs Belfield's maths set have been investigating pentominoes in maths. They have worked together to solve the tricky problems. Mrs Belfield and Mrs Whiteley were very impressed with their resilience. Well done to you all. Y5/6 have been painting self portraits. Firstly they enlarged a photograph using a grid method and then they practised mixing different shades. Finally they painted their sketches. Class 9 have been developing their badminton skills this term. Great team work. The children who were sitting around the side joined in as they were the referees. Class 7 were learning their spellings by playing spelling games this morning. This is a fun way to learn new words. Well done to everyone in Class 8 for bringing their favourite book into school today to celebrate World Book Day. It was wonderful to hear that so many different authors and genres are being enjoyed at home. Unfortunately Mr Ramskill, our percussion teacher, was unable join us this week so I challenged the children to demonstrate what they have been learning. The children were brilliant, they could share the musical terminology they now know and even managed to perform a short piece. The children have already learnt so much and I'm really looking forward to the performance at the music festival in June when all Y56 children will perform in front of other schools and an audience. Well done everyone, and to Mr Ramskill too for developing your skills and knowledge. Class 8 demonstrated excellent team work and resilience when cracking the Caesar Shift Cipher this week. We found out that during WW2 coded messages were sent to try and stop the Axis Powers from intercepting key battle strategies. Maybe you could use the shift wheel to write you own code at home? Air Raid in Class 8! We were surprised to find our classroom had been transformed into an air raid shelter last week. When we heard the siren we huddled together in the 'shelters', and tried not to panic until the air raid was over. We imagined how frightened, confused and uncomfortable children at that time would have felt. Then a radio address by Neville Chamberlain told us it was 1939 and Britain was at war with Germany. I'm sure you will agree, our finished products are fantastic- well done everyone! We carefully measured, cut and secured the components of our cam mechanisms. 17th November - Y5/6 parents came into school to join in with a maths lesson. Class 8 are working on their netball skills at the moment. Teamwork is a key requirement and today the children were set the challenge of working effectively as a team. The task wasn't easy initially, but after some reflection and evaluation, everyone was successful. What to do in a house fire. What happens in a court room and what a prison cell looks like. How to cross a road. Why not to run away from home. Class 8 have used fantastic collaboration and communication skills in our Roman buildings investigation. We were amazed at how much weight our columns held. The winning team managed to hold 27.5 kg! 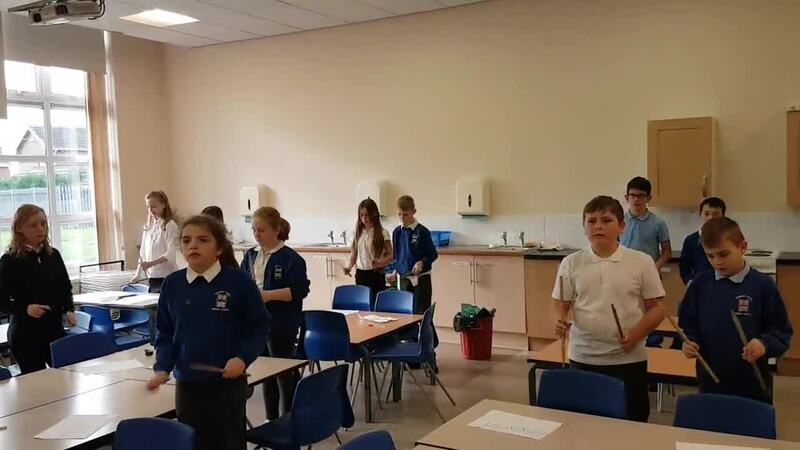 Class 9 have impressed their percussion teacher this week with their great rhythm and listen skills. You can see that they are all really concentrating. We can't wait to hear them play at the Christmas concert. Take a look a Y5 and 6 performing at Elsecar Heritage Centre. They were amazing and you could see that a lot of time and effort had been put in to learning their instruments. We all really enjoyed the music festival! Well done everyone in year 5 and 6. Today, Mr. Horton's maths group have been measuring beangbag throws accurately using trundle wheels and meter rulers. We had to be as accurate as possible and use our knowledge of converting between mm, cm and m to help us. Today all the children in Year 6 went to visit The Emmanuel Church on Huddersfield Road. The reason for this visit was to take part in a number of workshops and team building activities to help us with the transition from primary school to secondary school. The day was really useful and made us feel excited about secondary school but we were also able to discuss any worries we might have with a group of Year 7 students from Horizon Community College. Take a look at some of the activities we did. This year, Class 9 have worked extremely hard with their writing and Miss Stanley is so proud of how much progress her class have made. We decided this week that we were going to write a descriptive paragraph about this beach. To ensure it was really descriptive, we had to include magpie phrases, prepositional phrases and expanded noun phrases as well as a variety of punctuation and EVERYTHING that we have learnt this year. We had some fantastic paragraphs and Miss Stanley could really picture it in her head. Well done Class 9. Keep it up. Year 5 and 6 have been working on singing in a round, with a bit of a friendly rivalry forming between the girls and the boys. Who do you think sang their song better? It was wonderful to see Class 7 working together today. They were looking at artefacts and deciding what they can tell us about Anglo-Saxon life. Upper Key Stage 2 were working on their batting skills this week. Class 9 tried really hard to ensure that they were holding the bat correctly and if they were unsure, their classmates stepped in and helped. Class 8 have started to plant carrots, beans and potatoes in their raised bed. I wonder if their class will win the gardening cup at the end of the summer? Some Year 5 children have completed a bikeability course which teaches them how to ride safely on the roads. Well done done for successfully completing the course. It was lovely to see parents coming in to look at our learning this afternoon (8th March)! Class 8 have been looking at computer systems and were playing "The orange game" to investigate how computers avoid deadlocks (where too much information reaches the same place at the same time). A Letter from David Cameron - In Y5/6, the children came up with questions to ask David Cameron. The most popular were: Will smoking eventually be banned in England? and what are we doing for homeless people? Our local MP ,Dan Jarvis, took these questions to be answered by David Cameron, our Prime Minister. On Friday the 26th February, Dan Jarvis returned to our school with Mr Cameron's response in a letter and copies of this will be sent home. 23rd February Y5/6 Singing in the Community - Y5/6 went to the church this afternoon to sing to Athersley Cares Community group. Some of the children also performed pieces on the clarinet. What an amazing week at Ullswater! The children were superb and loved all the different activities ! Take a look at the pics below! In science this week, Class 8 have been creating 3d models of the Earth, showing all of the layers which form our planet. Next, we are going to be labeling these with our new scientific knowledge - Can you work out what each layer might be called? In Miss Stanley's maths set this week, we have been working on our problem solving skills. The children worked extremely hard to complete the Shape Sudoku. They had to be resilient because it was really challenging. Well done! Keep up the good work. 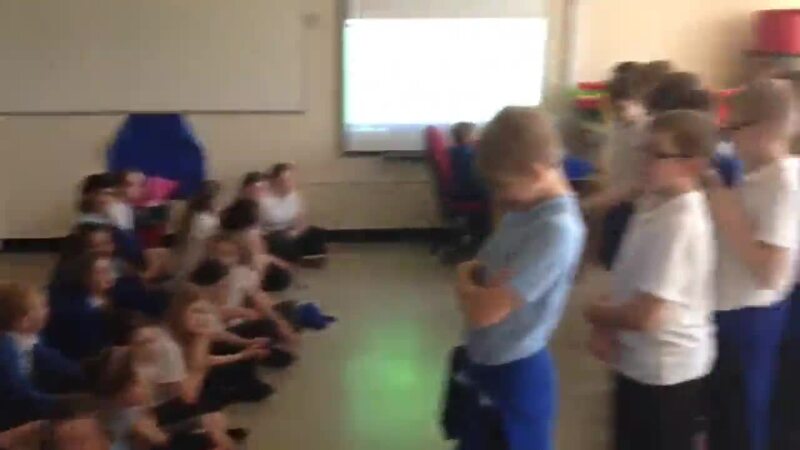 For the last 4 weeks Class 9 have been putting together a dance to the 007 theme music. They have been learning about levels, props, unison, mime and capoeira. In their Forest Schools session this week, Class 9 were challenged to make a class nest. During the task the children were resourceful, showed their resilience when moving large items, worked exceptionally well together (relationships) and were reflective along the way, evaluating their nest and making changes as necessary. This year Class 8 are learning the trumpet or cornet and Class 9 are learning percussion. This week Class 9 played their instruments for the first time and they were brilliant! Next week look out for pictures of Class 7 playing the clarinet. Every Monday afternoon, Class 9 have their percussion lesson. Each week a child is awarded the sticks of wonder if they have tried really hard. Well done to these two children for being awarded the sticks of wonder over the last two week. 17th September - Y56 are developing their orienteering skills this half term. This week they had to weave in and out of trees (cones), cross logs (hurdles) and jump across stepping stones (marker circles). 14th September - Our Forest Schools challenge this week was to build an elf house using resources from the woodland. The children had to work together in their teams to solve problems. At the end each group shared their finished piece with the rest of the class. Look carefully when you are next in the woodland and you might find that a family of elves have moved in! Class 8 spent a wonderful morning performing in the Barnsley Music Hub's Summer Concert. We performed alongside 7 other schools, first having a solo spot before all the schools joined together to play In The Hall of the Mountain King. The children in classes 8 and 9 were divided into teams. Each team could select three pieces of equipment from the scrap shed. Then, working as a team, they had to move from one end of the field to the other without standing on the grass. Here are the fantastic finger puppets we made during Arts Week. Aren't they wonderful! We used our team skills and resilience to make bridges out of newspaper. Take a look at our creations. In the woodland today Class 9 developed their ability to work with others and be resilient. They made forest face sculptures on the trees. Last Monday Class 7 completed a circuit in PE in order to raise money for the NSPCC. They all worked so hard and we also won the best class participation award in KS2 for raising the most amount of money. Well done team Class 7. During their library time Class 8 found some words and phrases that you might want to put into your own writing. Y5/6 have been busy learning about evolution. Take a look at our creatures to see how they have evolved. 2nd March. Today Class 9 went out into the woodland and played a game which involved trusting others. They all worked really well together. Class 8 have been designing a new invention to write an explanation. What do you think to our designs? Key Stage Two have been very creative in Spanish this week, and have written, edited and performed a rap!! Alistair keeping to the beat! Yo yo yo... Declan y Kierano! Arnella y Owen pumping it out! Even rhyming it up en espanol!